Bill Bryson, the American author and renowned anglophile, is Durham's greatest fan. In his bestselling eulogy to Britain, Notes from a Small Island he wrote: "I got off at Durham... and fell in love with it instantly in a serious way. Why, it's wonderful - a perfect little city.... If you have never been to Durham, go there at once. Take my car. It's wonderful." 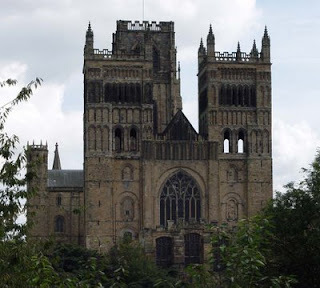 Perched on densely wooded banks, high above the River Wear and visible from just about every corner of the city is the magnificent cathedral: one of the best examples of Norman architecture in Europe. It's origins date back to the 10th century when a community of monks were driven out of their home on Lindsfarne by Viking raids. Carrying with them a precious cargo which included the venerated remains of St Cuthbert, they eventually settled on a loop in the River Wear, where they built a monastery as a shrine to St Cuthbert. When the Normans arrived around one hundred years later, they seized the site, which is almost completely surrounded by water and, recognising its natural defensive strengths they destroyed the monastery and built a cathedral in its place. Incredibly, the Normans continued to revere St Cuthbert and his remains survived the upheaval. So having endured the Viking raids, the Norman takeover and later, the Reformation and Civil War - the priceless, 7th century relics of the north's best-loved saint remain on display in the cathedral's Treasury. One of the best vantage points from which you can view the cathedral, and the adjacent Norman castle, is the Framwellgate Bridge. From there, you can take a walk up the shady riverbank path or take a Prince Bishop cruise boat which operates from Easter to October - the perfect alternative for all those weary American tourists!